White House Press Secretary Dana Perino was hit in the face with a microphone in the aftermath of a man hurling a shoe at President George W. Bush. White House Press Secretary Dana Perino was slightly bruised in the aftermath of the shoe-throwing melee at President Bush's news conference at the Prime Minister's Palace in Baghdad on Sunday, a senior administration official said. 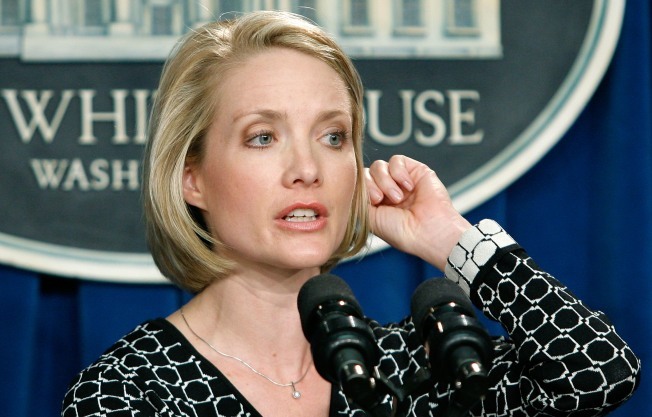 Perino was hit in the face with a microphone as security wrestled with the reporter, NBC News reported. The White House transcript from the news conference labels the incident an "audience interruption." President Bush said. "Okay, everybody calm down for a minute." Then, indicating Prime Minister Nouri al-Maliki, the president continued: "First of all, thank you for apologizing on behalf of the Iraqi people. It doesn't bother me. And if you want some — if you want the facts, it's a size 10 shoe that he threw. (Laughter.) Thank you for your concern, do not worry about it." The president then brushed off a question from a reporter who was asking about the greater meaning of the fracas. "So what if a guy threw a shoe at me?" Bush asked. Air Force One left the Washington area on Saturday night, and Bush and his aides are scheduled to return Monday. His presence in Iraq was not reported until Sunday morning Eastern time.